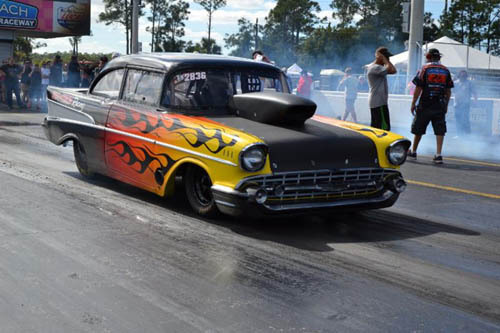 JUPITER, Fla. -- Weather was prime for racing this past Thanksgiving Weekend as more than 300 hundred racers faced off on the drag strip for a win during the 34th Annual Bennett Auto Supply Citrus Nationals presented by South Florida Chevy Dealers. It was a wild weekend of racing, complete with Bob Motz setting the tower on fire with his Kenworth Jet Semi Truck during the first pro show on Saturday. Exhibition passes throughout the weekend featured the Nitro Harley team of Jay Turner Racing, Paul Smith Racing with the Jungle Jim Nostalgia Nitro Funny Car, and the Larsen Motorsports Jet Dragster team. The event this year was run at the 1000 ft mark for all of the classes except the Quick 16 Door Car and Jr. Dragster. Classes included both heads up and E.T. racing. Pro Mod was the featured heads up class of the weekend with qualifying on Saturday and eliminations on Sunday. John Hall from Sunrise, Fla. took the No. 1 spot running a 3.798 second, 197.62 mph pass during the final round of qualifying along with leading all three sessions. A very strange end for the race on Sunday in the early evening hours. During the Semi Finals, Adam Flamholc from Sweden faced off against John Hall. Before the tree was lit Hall's team declared that the car was broke and had to push it back behind the tower. Flamholc was informed from the starter it would be a bye run then failed to stage his car, driving it down track. He was subsequently disqualified for not taking the tree and recording a time during his pass. The second pair of the Semi Finals became even more important as the winner would automatically win the entire class. Kevin Fiscus from Jacksonville, Fla. was up against John Benoit of Montpelier, Vt. Fiscus had a .022 second reaction time to the .051 second reaction of Benoit making it a close start. Benoit could not get the car to hook up forcing him to peddle it as he made his pass. Fiscus took the win laying down a 3.855 second, 210.28 mph pass. The Outlaw 632/X632 and Ultra Street classes, also heads-up classes during the weekend, had qualifying on Saturday and eliminations on Sunday. 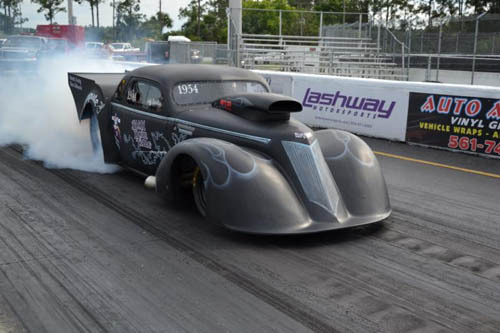 In the combined class of Outlaw 632/X632 it was the 'Playmate' 1937 Chevy of Jeff Ensslin from Lakeland, Fla. taking top honors over the weekend. Ensslin had both the low ET and No. 1 qualifying position heading into Sunday Eliminations. Johnny Pluchino from Commick, NY. faced off against Ensslin in the final round. Pluchino had the faster reaction time but could not get the car to hook up while Ensslin took the win light after running 4.528 seconds at 155.51 mph. In Ultra Street, the final class running heads up over the weekend, Mustangs dominated it taking both the win and runner up positions. The low ET and No. 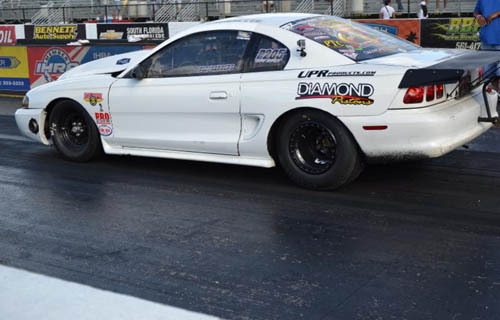 1 qualifying position went to Troy Pirez of Settner, Fla. in his 1994 Ford Mustang on Saturday. In the finals, Pirez faced the 1989 Ford Mustang of Ari Birchfield from Hollywood, Fla. Both cars staged, the tree was lit but it was a red light for Birchfield as he went -.029 to give the win to Pirez running a 4.982 second, 141.65 mph pass. The Quick 16 classes ran during Sunday. 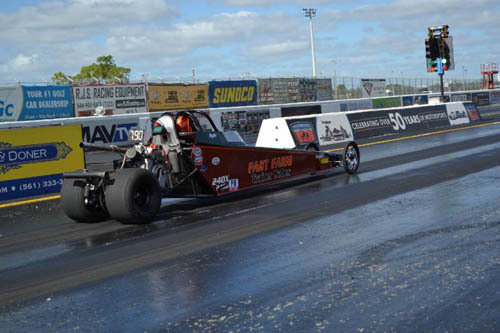 The Quick 16 Dragster finals featured two Jupiter, Fla. residents doing battle. David Hoxie dialed in at 6.10 to that of Keith Russell at 6.00. Both reaction times were within .012 seconds of each other but it was Russell with the win running 6.016 seconds, at 168.16 mph. The Quick 16 Door Car, which ran at the 1/8 mile, featured Steve Hatfield of Deerfield Beach, Fla. against Kenneth Anderson from Lake Worth, Fla. Again both racers fired off reaction times only .014 seconds apart from each other but at the top end it was Hatfield with the win as he laid down a 4.904 second pass at 139.41 mph. 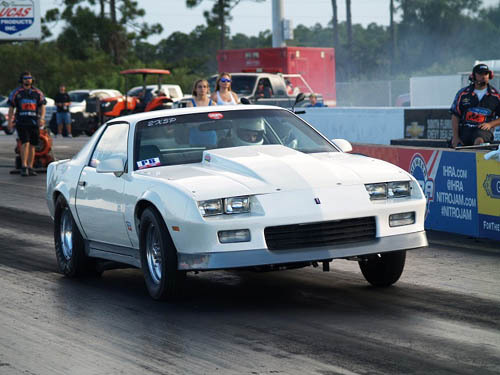 In Super Eliminator, Saturday it was John Russo from Palm Beach Gardens, Fla. taking the win over Bryan Haas of Palm City, Fla. Russo dialed in at 7.36 and hit his mark running 7.365 seconds at 138.10 mph to get the victory. 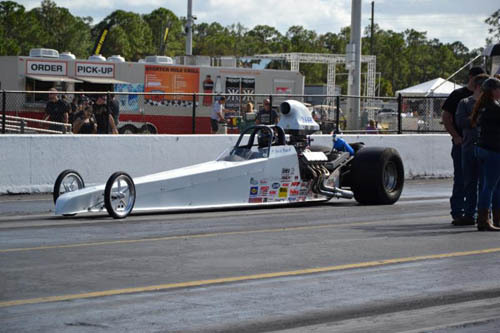 Sunday featured Paul Schultz from Lake Worth, Fla. going up against Robert Owens of Malabar, Fla. Owens dialed in his 1971 Ventura at 7.87 seconds to the 6.10 of Schultz driving his 2005 M and M dragster. Owens took victory by a very slim margin running 7.874 seconds at 129.05 mph. 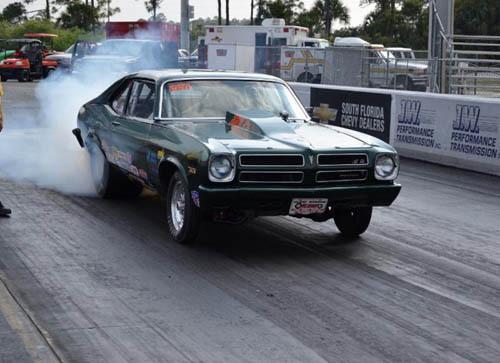 In Modified Eliminator, Doug Parlamento from Lake Worth, Fla. took victory on Saturday defeating PBIR's own Mitch Popi from Hobe Sound, Fla. Parlamento dialed in at 9.17 seconds to run a 9.158 second, 109.22 mph pass after Popi red lighted on the tree with a -.021 reaction time. On Sunday, Sonny Freeland, 2015 PBIR Modified Eliminator Champion, took victory as he defeated Saturday winner Doug Parlamento. Freeland from Hollywood, Fla. dialed in at 7.49 seconds to run 7.522 seconds at 128.74 mph to take the win light away from Parlamento. 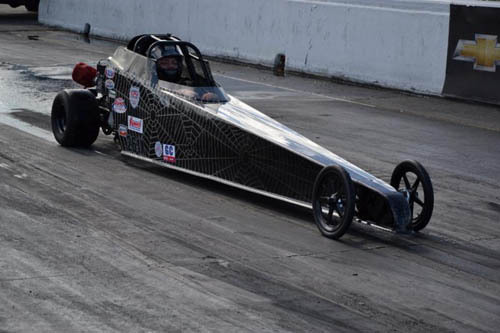 In Jr. Dragster, Melbourne, Fla. resident Bobby Craft defeated Kyle Leavy from West Palm Beach, Fla. Leavy dialed in at 12.05 but ran 12.210 seconds at 52.77 mph while Craft put together a superb pass dialing it at 7.99 and running 7.99 seconds, 79.81 mph to take victory. On Sunday, Kyle Anderson of Lake Worth, Fla. faced Kyle Philhower from Pompano Beach, Fla. Philhower dialed in at 7.99 seconds to the 7.97 seconds of Anderson. 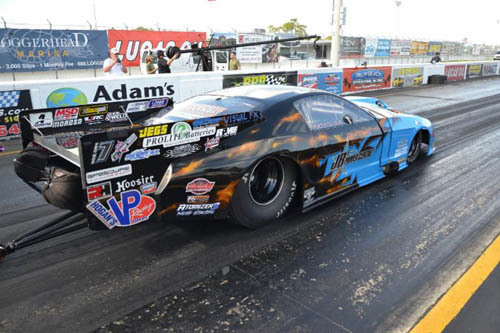 It was a very close race with Anderson firing a .001 off the tree to run a 7.976 seconds at 78.01 mph and take the win from Phihower whom ran 8.001 seconds at 81.98 mph. 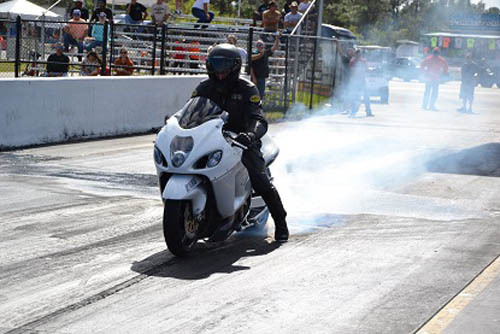 In Street Bike, the weekend was owned by Seth Buccieri from Davie, Fla. as he rode his 2002 Suzuki Hayabusa to victory both days. On Saturday, Buccieri knocked out Charles Jolly from Ft. Lauderdale, Fla. in the finals and defeating Charles Parvin on Sunday for the overall victory. Beat the Heat hosted their World Finals on Saturday, featuring first responders from across the United States for the title of being the fastest. In the final, Palm Beach County Sheriff Lt. Rey Alonso from West Palm Beach, Fla. faced Jim Harris of Corsican, Tx. As the two approached the line Lt. Alonso declared something broke in his car and victory went to Harris in his 1971 Chevrolet Chevelle. Pro Mod: Kevin Fiscus, 3.855 seconds, 210.28 def. John Benoit(Semi-Final), 4.127 seconds, 179.40 mph. Outlaw 632/X632: Jeff Ensslin, 4.528 seconds, 155.51 mph def. Johnny Pluchino, 5.230 seconds, 107.97 mph. Ultra Street: Troy Pirez, 4.982 seconds, 141.65 mph def. Ari Birchfield, Foul. Super Eliminator (Box): Robert Owens(7.87), 7.874 seconds, 129.05 mph def. Paul Schultz(6.10), 6.1006, 169.13 mph. 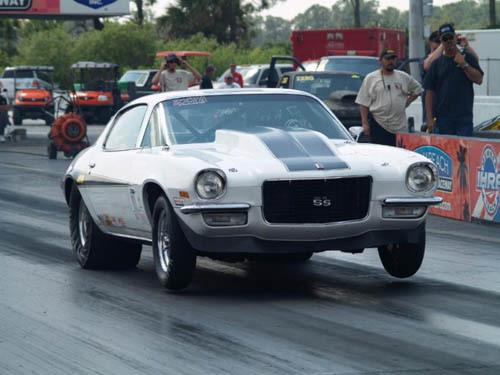 Modified Eliminator (No Box): Sonny Freeland(7.49), 7.522 seconds, 128.74 mph def. Mitch Popi(9.20) 9.209 seconds, 108.89 mph. Jr Dragster: Kyle Anderson(7.97), 7.976 seconds, 78.01 mph def. Kyle Philhower(7.99), 8.001 seconds, 81.98 mph. Street Bike: Seth Buccieri(7.55), 7.695 seconds, 111.57 mph def. Charles Parvin(9.03), 9.047 seconds, 120.49 mph. Super Eliminator (Box): John Russo(7.36), 7.365 seconds, 138.16 mph def. Bryan Haas(6.05), 6.069, 159.34 mph. Modified Eliminator (No Box): Doug Parlamento(9.17), 9.158 seconds, 109.22 mph def. Mitch Popi(8.80) 8.806 seconds, 115.00 mph. Beat The Heat World Finals: Jim Harris(9.90), 10.118 seconds, 82.84 mph def. Rey Alonso, Broke. Jr Dragster: Bobby Craft(7.99), 7.997 seconds, 79.81 mph def. Kyle Leavy(12.05), 12.210 seconds, 52.77 mph. Street Bike: Seth Buccieri(7.49), 7.581 seconds, 121.80 mph def. Charles Jolly(7.45), 7.430 seconds, 135.95 mph. For complete race results click here.